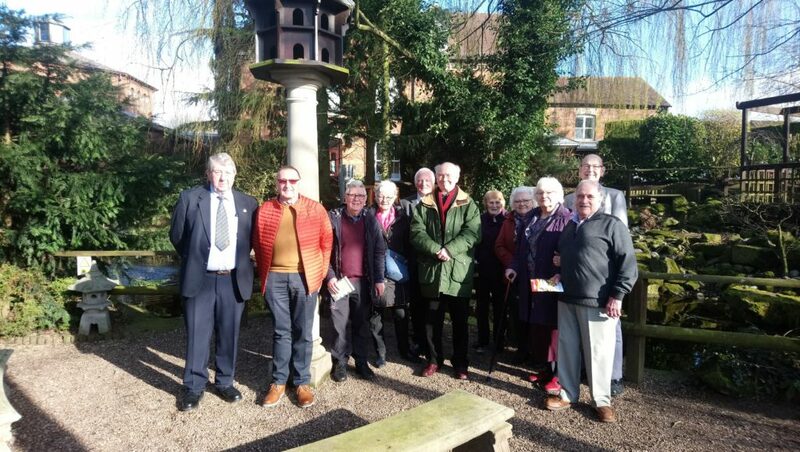 On the 18th March 8 club members and guests visited The National Holocaust Centre and Museum at Laxton, near Newark. It is a very peaceful and well tended area of gardens, (the roses will be magnificent in a few weeks time) with water features and areas set aside for meditation. The idea of visiting this place is to some, one with which they will not countenance, but the fact is that it is beautiful place which portrays the horrors of this period in a factual, but not sensational, manner and leaves you thoughtful rather than horrified. 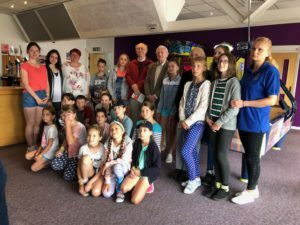 After an introductory film and a visit to some of the exhibitions we entered the theatre and, along with a room of full of children, heard of the experiences of a Dutch Jew who grew up in the war years (he was only 6 by the end of the war). After this we had little time to wander round the exhibits, which are very interactive and cleverly laid out. It was agreed by all a very interesting day and, certainly some will return as there was not enough time to see everything and maybe the roses will be in bloom. A capacity audience at Riddings Community Centre on the 15th of March were entertained by the Stormy Weather Boys and raised £744.00 in aid of the Rotary Charity The Jaipur Limb Project. Thank you to all who supported us on the evening. Colin Fox received a great surprise after giving a talk on the problems of Alzheimers to West Ashfield Rotary Club last week. For his services to the District on the ‘membership committee’ Colin received a sapphire pin in recognition of all of his hard work. Colin on the right, received his ‘pin’ from Michael Longdon, President of West Ashfield and Past District Governor. 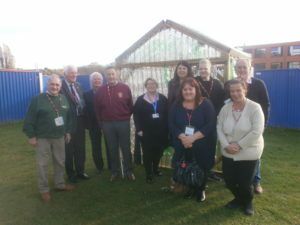 Members of the Rotary Club of Alfreton, Staff of Woodbridge School and members of the Parent Teachers Association line up in front of the completed Eco Greenhouse that has been donated by the Rotary Club and built with help from the schools PTA. 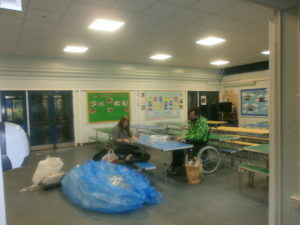 Some of the team assembling the bottles that form the roof and walls. Alright who knows which bit goes where! Grub up. 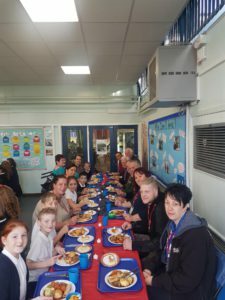 The team share a meal with pupils. 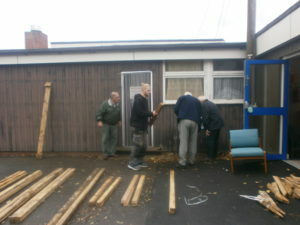 On Monday the 3rd of September we celebrated our 80th Charter Anniversary at Riddings Community Centre. 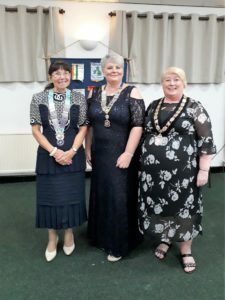 The members were joined by Cheryle Berry the District Governor and fellow Rotarians from our mother and daughter clubs together with other Rotarians from within the District, Mary Kerry the Mayor of Alfreton and other guests. Following an excellent meal and speeches we were entertained by the ‘Gold Leaf Duo’. All present went home with an anniversary cake kindly supplied by Mandy our President. The club now looks forward to our next 80 years serving the communities both at home and abroad. On Sunday the 2nd of September we were present at the our local ‘Party in the Park’ demonstrating an Aquabox filtration pump and engaging with the public explaining how Rotary supports local, national and international projects and charities. President Mandy and the members of the clubs International Committee had the pleasure of meeting the twenty children aged between 7 and 15 years of age from Belarus who are suffering from the after affects of the nuclear fallout from the Chernobyl disaster. The children are staying in East Derbyshire with volunteer hosts as guests of the Chernobyl Children’s Life Line Charity. The aim of the charity is to provide the children during their four week stay is for them to receive the benefit of uncontaminated and healthy food, clean fresh air and a healthy environment in which to convalesce, together with medical assessment and treatment where necessary all in an effort to rebuild their much depleted immune systems and give them hope and the opportunity of improved health. We met the children yesterday at the Genesis Centre Alfreton being one of the many outings and entertainments they will attend during their stay. The club is pleased to have paid the travel cost of £458. for one of these children to come on this worthwhile convalesce holiday. President Mandy accompanied by three club members were privileged on behalf of the Rotary Club to be invited to attend the David Nieper Academy prize giving evening on Thursday the 19th July. To hear the Head Teacher Dr. Kathryn Hobbs give a round-up of the years activities and an inspirational talk by the Guest Speaker Mrs Julie Richards Principal of Chesterfield College. 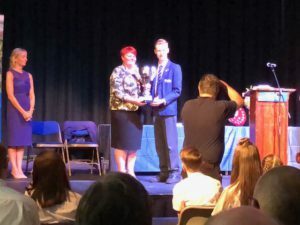 Followed by the presentation of the Awards to the many students who had earned prizes in their school subjects, Attitude to Learning Awards, Outstanding Achievements Awards and Special Individual Awards. 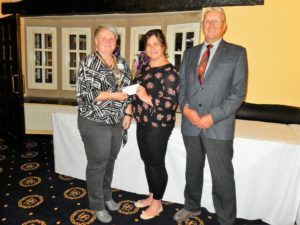 The photo shows President Mandy Oldknow presenting the Rotary Matt Bingham Award together a cheque for £50. to Joshua Green for his contribution to Academy Life. 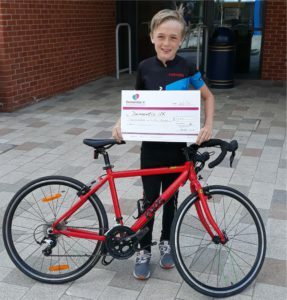 Joshua was nominated for his work ethic, his work in the Academy library, his assistance in the IT department and his work as a anti bullying ambassador. We were entertained during the interval by the Academy Choir and by pupils playing the piano. The evening closed with a talk by the Vice Chair of Governors David Nieper. Alfreton Rotary Club members wish all of the staff and students for the next academic year an enjoyable and successful year.